An interview with Nicki Greenberg. Conducted by Philip Bentley, 26/02/08. 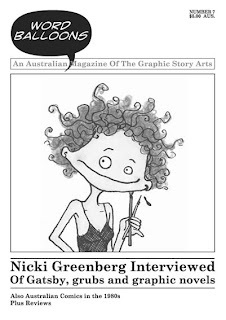 Without really planning it Nicki Greenberg has become something of the face of literate graphic stories in this country. Following the successful publication of her unique adaptation of F. Scott Fitzgerald’s The Great Gatsby last year she has been feted in the news media and at writers festivals around the country. To discover the path she has followed to reach this point I have placed her under the spotlight (or beside the microphone) as this issue’s feature interview. In the interview you will read of her multi-faceted career as cartoonist, author and lawyer, her youthful creative endeavours, her path to and through the momentous task of adapting one of the major works of twentieth century literature and what she plans to do for an encore. PB: Tell us something of your childhood. I’m guessing you wrote and drew a lot. NG: I’ve been writing and drawing for as long as I can remember. As a child I was constantly scribbling. I was the kid who would get told off in class for doodling while the teacher was talking. And I loved writing stories. PB: What about comics. Where do they come in? NG: When I was about seventeen I started drawing these little page long cartoon strips. They were semi-autobiographical stories about my character Bug. I loved doing them and soon started doing other strips, gradually getting more and more into it. What really blew open the comic world for me was when I went over to Canada on a student exchange in my final year of Uni, 1996. Over there (in Montreal) I met other cartoonists and got involved in comic jams and anthologies with them. When I got back I started to meet people in the Melbourne indie comics scene and contributed to various anthologies like The Pointy End, Tango and Silent Army. PB: I gather you first encountered The Great Gatsby at school. NG: I studied it in my Year 12 Literature class. I completely fell in love with it. PB: Was it always your desire to adapt it? NG: No, I probably didn’t get the idea until about 1999. PB: How did the project develop? Were the characters always going to be cartoon creatures? NG: Yes, but the original drawings were much more detailed than what I ended up with. Although they didn’t look like Edward Gorey pictures they still had that level of line work. I don’t know how many decades that would have taken. [Laughs.] I’m glad that I simplified the characters, not simply because it meant I got the work done in six years rather than sixteen, but because it made the characters look more lively and immediate. Their expressions were fresher and I think it helped the look of the book. So the first step was doing all the character studies. I then did a lot of research to get source material for the sort of houses, buildings, gardens and cars of the period. PB: Was it always going to be designed like a photo album? NG: Yes. I love to look of panels on a black page and that’s probably what got me thinking in that direction at the beginning. PB: Was there a concern with doing it like that that you might lose some of the sequential movement from panel to panel? NG: I tried to be very careful to make it easy to read. Quite a bit of thought went into the placement of the panels on the page. There’s a lot of intuitive nudging of frames slightly closer together or a little bit higher or lower so that it feels natural to read. I did want to have a lot of black space around the frames, especially for readers who aren’t used to the very compacted nature of the traditional comic page. I wanted it to act as a sort of breathing space for the eye. PB: Did you look at other examples of comic adaptations of literary works, like Hunt Emerson’s Lady Chatterley’s Lover (Knockabout, 1986) or even Classics Illustrated? NG: No, I didn’t look at anything. Nor did I look at any of the movie adaptations. I wanted to lock myself away with just the text. It wasn’t until I was a good way through it that I read biographies of F. Scott Fitzgerald. I wanted to develop an intimate relationship with the text. PB: When in the creative process did you find a publisher? I’m assuming that at the beginning you just started on spec hoping to find a publisher down the track. And to begin with you must have needed to maintain quite a bit of faith in it and yourself. NG: Yes, it’s a bit like Gatsby’s mad dream. [Laughs.] I always wanted it to be published, but I had been working on it for five years before I found one. During that time I had some other books published, but they weren’t graphic novels. In some ways I tried not to think of the possibility of it not being published. [Laughs.] When I first showed it to Allen & Unwin, which was after I had been at it for a couple of years and had done 100 pages of finished work, they were very enthusiastic, but at that stage to put out a graphic novel in Australia was a big challenge. A major problem was the varying copyright periods around the world. It was out of copyright here, but not in Britain or the US, and if they couldn’t publish it in those markets they didn’t think it would be viable. So it was really exciting when a bit later they decided to do it. NG: I think it was a whole cultural shift thing. Partly it was because the market is more receptive now. PB: The next graphic novel you are working on is Hamlet. Why another adaptation? Why another set text? NG: I love the process of adapting and I find it endlessly fascinating to engage with a brilliant text. You add your own interpretation, but you’re mining something that is very rich. It’s like asking a musician why they keep playing Beethoven. [Laughs.] It’s because it’s something you can draw so much from. I could make up a story of my own, but at the moment I am getting so much out of the dialogue with these amazing texts. Hamlet is an extraordinary play, and one which has been explored and reinterpreted for centuries. It’s inexhaustibly fascinating, because it keeps on making us engage with those huge eternal questions about our existence. Irresistible! The rest of the interview can be found in Word Balloons 7. My Life in Comics Part V: Inkspots–the later years 1981-84. This is the fifth of a series of articles chronicling my path as a comics aficionado in Australia over the past forty years. These articles have been inspired partially by a sense of nostalgia, but also to record certain aspects of the local comics scene for posterity. These are firstly, the patterns of comic collecting in the 1960s and 1970s, a process that has been irrevocably changed by the arrival of comic stores; secondly, the beginnings of comic fandom in Melbourne and Australia; and lastly, my reflections on the establishment and running of two comic magazines and a shop (Inkspots, Fox Comics and Minotaur). Primarily these are my recollections alone and make no claims to be the authoritative view. It would be interesting to see more recollections, especially from those in other states. In the last instalment (WB 5) I detailed how in the mid-1970s Greg Gates, Colin Paraskevas and myself undertook to publish a comic anthology initially with the intention of seeing our own work in print, then as the project progressed including others as well. One reason the project expanded was that there weren’t any comparable publications in Australia at this time. Indeed, there were hardly any local comics being published period, neither at a commercial, nor even at a small-press level. Following the release of Inkspots 1, in the middle of 1980, we began to plan the next volume. Whilst the year it took to produce was considerably quicker than the five it had taken for the first one it still seemed to move at a snail’s pace. Again we were hamstrung by all creators working on it after hours given projected sales were not enough to allow us to pay contributors. I am not conscious that our philosophy for the production of issue two was significantly changed. Certainly, from my perspective, I was still looking for works that pushed the envelope creatively. Instead, changes were made in the production values, with the magazine being printed by a major printer on slick paper and with colour inside the cover as well as out (the interior remained in B&W). Once again there were a great diversity of styles on parade, even more than the first issue. This is something I think I saw as a strength at the time, but now tend to feel took the issue in too many directions at once. Carry over creators from issue one included myself, Greg, Colin, Chris Johnston, Stephen Campbell, Darrel Lindquist, Stuart Mann, Martin Trengove, Phil Lyng & Trevor Sumper. They were joined by Russell Edwards, Tony Crooks, Malcolm English & Ian Eddy. However, the most striking new contributions came from Fil Barlow and Phil Kanlides, both then just eighteen and chock full of talent and confidence. Inkspots 1 had primarily been distributed through US comic distributors. With this issue we took the plunge by adding the local newsagent distributor Gordon & Gotch. At the time this was not a difficult task to achieve. From memory we gave them 2,000, keeping another 1,000 for overseas distributors and our own sales. Sales were, however, were modest. From memory we achieved a sell through rate of sixteen percent across Australia, peaking in the mid-twenties in Melbourne and Sydney, but dropping into single digits in more far flung rural areas. Whilst I may not have been surprised by these results it was still a disappointment. Although I think I was more hung up on the ‘comics as art’ ethos than Colin or Greg I was still needled by this perceived failure and for a time became more compelled to achieve higher sales. So our emphasis for issue three became to make the book more accessible by including stories with a greater emphasis on narrative and continuing characters. As time wore on, plans were made, meetings were had, strips were started, but it seemed the harder we pushed the longer things took. The rest of the article can be found in Word Balloons 7. Also, reviews of Bruce Mutard’s The Sacrifice “the first in a trilogy of graphic novels that may indeed dare to dream such a thing as ‘the great Australian graphic novel’ exists”, Rooftops by Mandy Ord “an elegy to inner city life and her own idiosyncratic spiritual search”, Skye Ogden’s Vowels “a gem of a book” and Love Puppets by Grug & Mcleod “a romantic soap opera of the best kind”.